SAINT PETER, Minn. – In a match rescheduled from Sept. 19 due to poor field conditions at Viterbo, the Gustavus men’s soccer team Wednesday played host to the V-Hawks on its reserve field and extended its winning streak to seven with a 2-0 victory. The Gusties also increased their unbeaten streak to 11 matches as they improve to 12-1-1 overall. 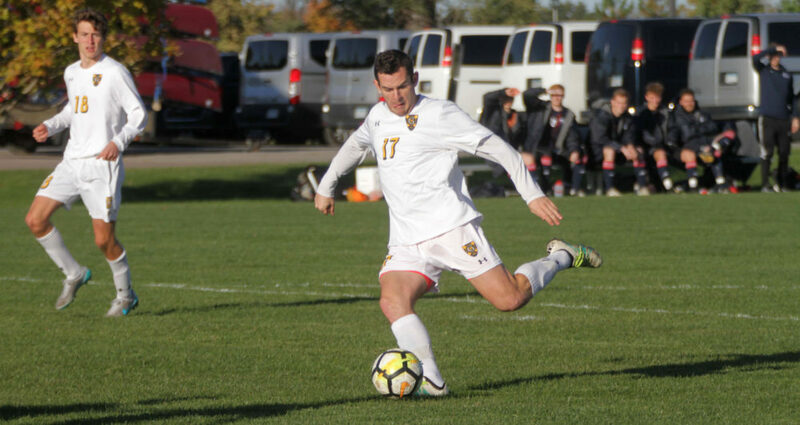 Five Gusties made their first start of the season and 24 players saw time on the pitch as they held Viterbo scoreless with just two shots – both late in the second half. Matt Gibbons (So., Minneapolis, Minn.) scored what proved to be the game-winner in the 40th minute. Luke Laurich (Jr., Batavia, Ill.) made a pass up the middle to Gibbons, who connected for his seventh goal of the season while extending his point-scoring streak to 10 consecutive matches. Gibbons now has a MIAC-leading 21 points. Less than two minutes later, Will Richards (Jr., Hudson, Wis.) played a pass though the legs of a defender up the right side, fired in a cross to Laurich who then scored on a toe-touch to the left side. Laurich is now third on the team with four goals this year. Keeper Anders Severson (Sr., Woodbury, Minn.) improved his record to 10-0-1 after 61 minutes of work. Matt Bateman (Sr., Savage, Minn.) played the final 29 minutes and made one save. The Gusties have this weekend off and return to the Gustie Soccer Field at 4 p.m. Tuesday as they host Hamline. A Gustavus win would clinch at least a share of the MIAC regular season championship.